What could be more important than ensuring that your children are as safe as possible when driving around town? I have followed Super Car Sear Geek on Facebook for a while watching for tips, deals on car seats and interesting facts about car seat safety. It became clear very quickly that Abbie (aka Super Car Sear Geek) knows her stuff and is truly passionate about what she does. Her Lehigh Valley Car Seat service offers FREE car seat checks to parents and caregivers in the region and has invaluable advice for families through her courses, checks and other available services. Recently partnering up with fellow CPST Erica McCabe the service has now expanded to provide car seat checks in the Pocono region also! Personally, I thought I knew everything I needed to know (I bet you do too). Abbie can teach even a seasoned parent some new tricks for keeping safe while driving ( I promise!). Attending a class and scheduling a car seat check probably are not high on your to do list, they weren't high on mine either. Keep reading and see why you might want to re-evaluate that to-do list, it will be worth your while! I cannot say enough how much this class and car seat check boosted my confidence in my ability to secure my children in our vehicles. It say sound "geeky" but the first time I drove with them in the back seat I thought to my self "I KNOW they are as safe as they can be" and I actually felt better and safer while driving them around. I recently attended her "Crash Course: Car Seat Safety for Caregivers" at The Growing Place in Emmaus. Abbie presented her course in an interactive, engaging way, by asking questions quizzing us on our past knowledge and by letting us be the inspectors of the seats shown above. She used videos that showed the severe impact that children endure during crashes. These videos showed in real time how improperly restrained children sustain impact during a crash. One of the most important items discussed which is extremely relevant during the cold winter months, is the fact that children are NOT to wear bulky winter coats while restrained in a car seat or boosters! Abbie had creative suggestions for how to keep kids warm and safe during the chilly winter months. This class is highly recommended to parents-to-be, current parents, child care providers, and grandparents and would make a great gift! I attended my course at The Growing Place in Emmaus. This local business offers a variety of services to parents, parents-to-be and caregivers. Pre-natal massage, breastfeeding classes, birthing classes, doula services, car seat safety, baby sign language and more! This unique center hosts a variety of services that support families and mothers/mothers to be. They also host a free mom's group for mothers and their children the 1st and 3rd Wednesday of each month. Their home-like setting is comfortable and welcoming and is tucked just off of Main St. in Emmaus making it quite convenient. Stop in to see their location and meet their friendly staff or drop in to their mom's group and meet some new friends and playmates. Abbie and I met to check our current seats for proper installation and fit. Her evaluation was so thorough, I was very impressed. She checked each child's weight and height and evaluated how they were sitting in their current seats. She determined our older child was near to growing out of her seat, which hadn't occurred to me yet! There are factors that go into determining a fit that Abbie knew and I did not. Her check was much more comprehensive than the check we received from the local police station and The Personalized Quick Reference Guide seat she left us with is a great reference tool to follow along with and monitor for when our children are ready for another switch. When purchasing car seats for our children the first 2 times we focused mainly on price, height and weight, looking for something that seemed to last a while and would meet our child's needs. If you ever been to the car seat section at Buy Buy Baby or Babies R Us, you understand the veritable jungle that one encounters when shopping for a car seat, its a nightmare, how could you possibly pick the perfect seat at the best price to last a long as possible?!?! 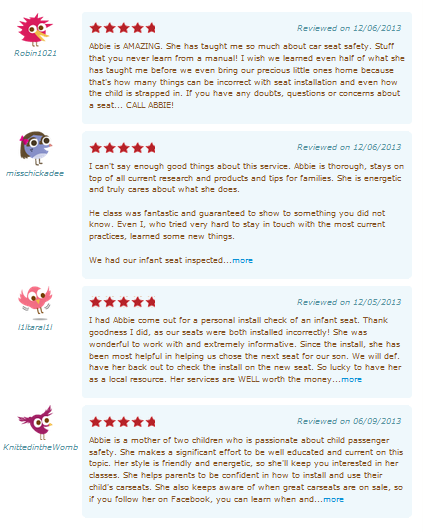 Abbie helps with this too, her car seat concierge service evaluates every variable that goes in to picking a seat and guides you to choose the best seat for your budget, child and car. Her extensive experience with different seats, vehicles models and safety regulations will guide you in your purchase. This service was AMAZING! She guided us in our purchase, helped find a great deal on the seat we needed after noticing that we were about to outgrow the current seat being used. She evaluated our needs for a seat and made recommendations based our our children's specific needs. I would never have been able to navigate the 1,000's of available seats with such ease had it not been for Abbie's advice. Our daughter was so excited by her new seat when it arrived, we regretted not wrapping it up for Christmas! I highly recommend this service to anyone who is looking for a new seat for their child, it is 100% worth the cost, especially in that Abbie certainly knows where to find a great deal on seats, so your cost could easily be cancelled out by the savings you get on a great deal. Interested in scheduling a free car set check? You can contact Abbie by phone or e-mail or through her facebook page. Like her page on facebook to follow along for great tips and tricks! Want to find a class to attend? March 2 The Growing Place will also be hosting a class! Contact Abbie to register. 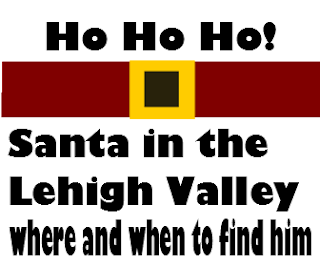 Thanks for visiting and please be sure to stop by http://lehighvalley.findandgoseek.net for more Lehigh Valley family resources, activities and fun for kids! Want to be featured on our blog?!? 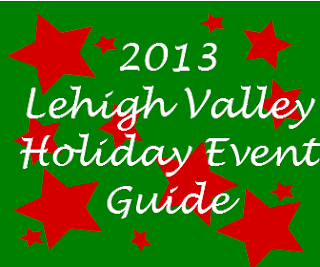 lehighvalley.findandgoseek.net has your kid friendly guide to holiday fun in the Lehigh Valley! Looking for a great place to see the big guy with your kids this year? We have a great list of places where you can get you child's photo with Santa! Even find a breakfast with Santa event that you'd love! 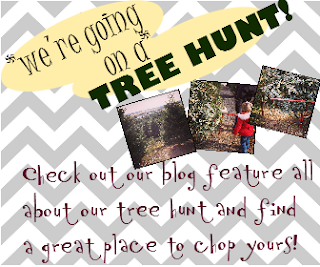 Use our blog archive to link to our "We're Going on A Tree Hunt" Post and read about out visit to Beck Yule Farm this season to find our tree. Check out our full list of Lehigh Valley Christmas Tree Farms and find a great place to have your own little tree hunting adventure. The Nutcracker, Christkindlmarkt? Christmas Village? Lights in the Parkway? These awesome local events are memorable and have become family traditions for many Lehigh Valley residents. Find a complete list of local events, activities and more here! We at Lehigh Valley Find & Go Seek want to thank you for supporting our website and appreciate you joining us in our first year of operation and look forward to you staying with us as we jump into our 2nd year of bringing the best of family friendly fun to Lehigh Valley families. Wear boots, or shoes you are OK with getting muddy. Bring a blanket to lay down on when you cut the tree, keeps mud and sap off of your coat. We visited Beck's Yule Farm this year, but we have a great list of Lehigh Valley Tree Farms here so find one that will work for you! Beck's is located just north of Schnecksville, close to a number of areas. 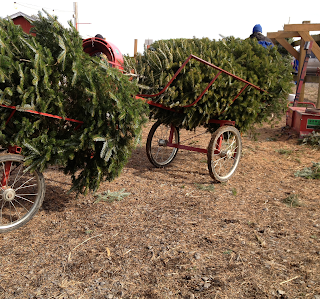 Allow for about an hour and 1/2 (2 of you are very picky) to arrive, cut, bundle and pay for your tree. Be sure to ask for your tree to be drilled if you have a Tree Stand that requires a pin. Our yearly "Griswold-esque" tree hunting was chiiillllllyyyy this year! In fact my kids implemented a boycott due to the cold. They hung out in the car with Mimi while the brave ones and made the hike up the hill to cut the tree. The little ones made a brief appearance when everything was just about done. Though we have always had excellent luck at Hill Farms in Lehighton and they have an amazing gift shop and wreath shop, which we love warming up in each year. We visited Beck Yule Farm this year forgoing our usual trek to Lehighton's due the lack of time and a desire to stay closer to home. Tree carts are available at Beck Yule Farm! There is a significant incline you need to climb on the walk to cut your tree, Various species are spaced up along the hill, so depending on what type you are looking for you may have a bit of a walk. We got a Frasier Fur which was about half way up the hill. There is a snack stand at the farm that offers warm foods near the little shed you pay at. Christmas cookies and other treats and warm drinks are available. When we visited (Saturday) Santa was at the farm, taking pictures with kids and handing our candy canes. My daughter wouldn't get within 20 feet of him but may of the kids were visiting with him while waiting for their trees to be bundled up. I thought this addition was a nice distraction for the kids. Though with no indoor escape from the cold Beck Yule Farm lacks a little in the "extras" some of the other local farms offer. It's a beaut' Clark! It was BUSY when we went, with only 3 weekends between Thanksgiving and Christmas this year time is limited for getting trees. We had to wait more about 20 minutes in line to have the tree drilled, shaken and bundled before we were able to strap it up to the roof. We felt that overall the size of the trees at Beck's were smaller than what we were used to cutting (most were under 9 or 10 feet). They may have had a section of taller trees, but we didn't see it. We would LOVE to hear about your tree cutting adventures, where you go and if you'd recommend it. Comment below and let us know! Lehigh Valley Find and Go Seek is proud to be a local supporter of parents, grandparents, aunts, uncles, teachers and kids! We are here are an active member of the community and as a resource to help support local kid friendly businesses and families. We have expanded our garb gear and gifts page to our newsletter and blog this month to feature a number of retailers that are offering great gift options to families. You can see a full list of kid friendly local shopping options this season by clicking here for our garb gear and gifts page. Does this come to your inbox? If not, sign up here so you never miss another newsletter again! 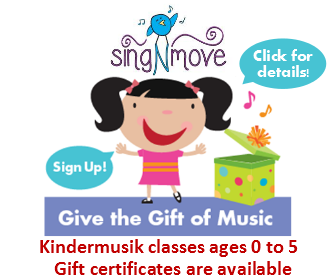 Sing n' Move offers preschool music classes for children ages 0 -5! Their fun active weekly program will enhance and foster your child's love for music and keep the whole family moving. Sing n' Move Offers classes in Bethelem, Coopersburg and Allentown at Ju-Ju Monkey starting in 2014. 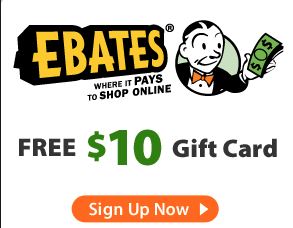 Call or e-mail them directly to purchase a gift certificate for a child in your life today. "My son and I have been attending Sing-n-Play lessons with Miss Lena since he was 4 months old. He loves the classes. Now at 1, he already developed appreciation for music, singing and dancing"
We cant imagine a cooler gift for a rock star wanna be than School of Rock music lessons! This Performance based music school focuses on classic rock and teaches fundamentals through high interest music and rockin' performances! Get some great discounts at the school of rock for this holiday season. Enroll for January and get February FREE, A great gift for the beginning musician as well as those which are more experienced. This local business offers great classes for musicians of all ages and with locations in both ends of the Lehigh Valley you can find a location that works perfectly for you! 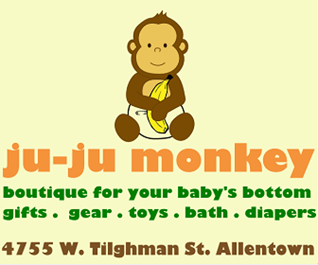 Ju-Ju Monkey is the newest local baby boutique. The store offers great baby items, gear and supplies for new moms. A number of classes are also offered at Ju-Ju Monkey that make awesome "non-material" gifts including music classes, My Smart Hands Classes, Children's Yoga and more! See a preview of their products, or shop online at ju-jumonkey.com anytime, free in store pick up is available. This store offers an awesome local spot to find unique baby items for the little one on your list! Enter now to Win a $25 gift card on our facebook page and like Ju-Ju Monkey to follow along with new products, classes and happenings. I just purchased the Pura KiKi bottles shown in this picture for our kids as a stocking stuffer! These 100% plastic free water bottles are super safe for kids, BPA free are are adorable, they come with drinking tops to be used for young children as a sipper/bottle or "sippy type" tops for older children, I can't wait to start using them! 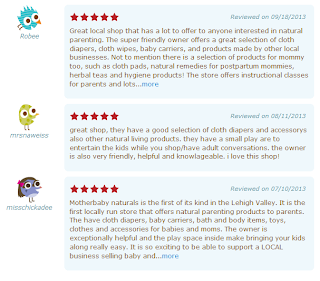 "This store is a fantastic local option for shopping for babies, and children. The store is well stocked with a large variety of items that would please anyone shopping for a little one. The store is well organized and the displays make finding what you need quite easy. The array of what is offered ranges from toys, to cups and bibs, lotions, baby care items, baby carriers, cloth diapers, unique gifts, and more. 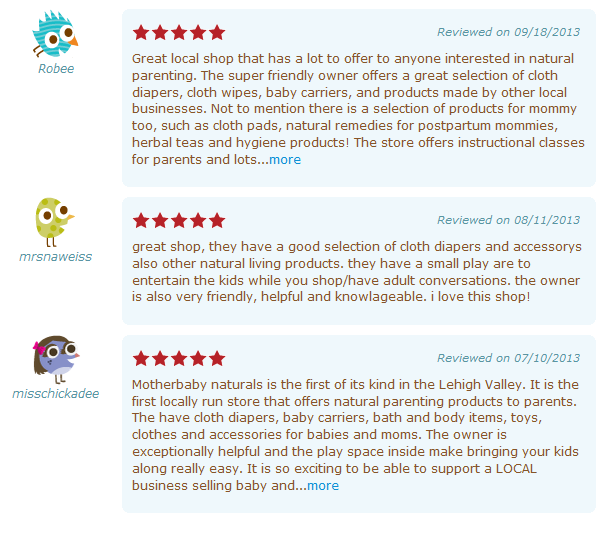 I cannot stress how MUCH this store has to offer parents, even for ones who are not interested in cloth diapering! It is definitely worth stopping in to shop"
Mason J.A.R. Apparel is a line of clothing hand-printed in Bethlehem, PA, that creates uniquely inspiring art work on comfortable kid’s clothes. Its imagery and color palette inspired by natures own playful images and culture across the four corners of the Earth. Local artist Jessica Ann Russell is the creative force behind Mason J.A.R. Apparel a home based business and dream. Inspired by her son Mason, her love for art, and fashion. Mason J.A.R. Apparel is launching their website just in time for the holiday season! 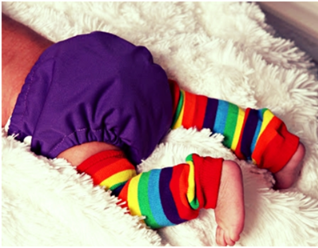 The website will offer 100% GOTs certified organic onesies in a range of beautiful colors. Printed with your choice of playful block print. All the garments are one-of-kind, hand block printed to order. Like them on Facebook for updates on their website launch and to view more samples of their work. We are proud to offer our newsletter subscribers an exclusive discount to receive 10% off any order until Jan. 1 2014 using the code FGSorganic. "Jessica is an amazing artist! 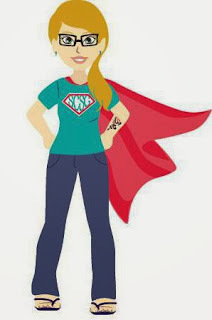 I wanted custom t-shirts for both of my boys for their birthday party, and without much direction, she came up with an awesome superhero design, and even added their names! The quality of the finished product is also amazing for being handmade. I've washed their shirts a dozen times and they still look good as new. Highly recommend!!" Their adorable gift wrapping is truly unique and makes a beautiful presentation for a holiday gift or any occasion. We will be gifting the one we recieved (shown above) and I can't bring myself to take it our of the sealed jar. The handiwork is beautiful and the pain is vivid and so pretty, can't wait to put this on our little one! 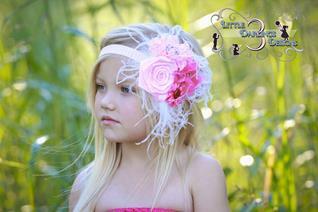 Three Little Darlings Designs features custom, handmade hair accessories and tutus to dress your little darlings! They hold weekly theme sales ranging from character related hair accessories to basic items! In conjunction with weekly sales they also have loads of albums stocked with ready to ship accessories and accept custom orders. This Nazareth based local mom is proud to offer adorable handmade products to local parents and is excited to offer these adorable gifts this season to local families. 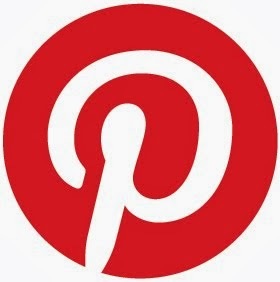 Like them on facebook to follow along for their upcoming sales and view more of their work! "Love, Love, Love!!! We love when there is a package from Three Little Darlings in the mail. Affordable, quick, great communication. Every piece is different and made with care. Their pieces are a talking point everywhere we go. And my 1 year old loves picking out her headband for the day. Would recommend to anyone at anytime!" Mother Baby Naturals : This local store located in Bethlehem at Geopp and New Streets offers great eco friendly products for young families. 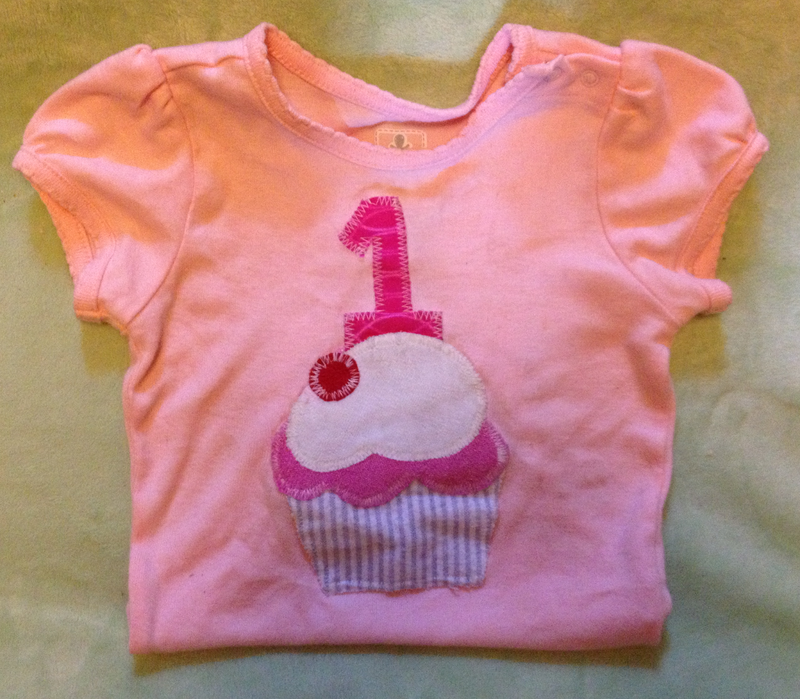 The store features, handmade apparel, gifts, bath and body products, cloth diapers, toys and more. They stock some great gifts for babies, moms, and moms to be! They will be celebrating Small Business Saturday this week on 11/30 with a number of sales and specials. From 11am - 7pm They will offer FREE Gift Wrapping, FREE 'Shop Small' Reusable Shopping Bag, a FREE 'Changing Diapers' book with $49 purchase! and FREE product samples with every purchase! In store Giveaways from Sweet Pea Diapers, Squooshie, Eco-Kids and more! Like them on Facebook! Online shopping is available 24/7 at http://www.motherbabynaturals.com Local delivery/pickup can be arranged or use their low-priced flat rate shipping. "Great store, wonderful owner. I went there to buy a baby carrier. She showed me how to optimize its use. the experience felt more like a talk with a more experienced and willing to share knowledge friend, rather than shopping at a large retail store where you are just a nuisance. I will definitely be coming back to this store." Give the gift of music this year! Spend a joyful, music-filled time with the children you love, and watch them grow! Create precious, shared memories far more valuable than any toy. The Meandering Monarch offers Music Together® classes for infants, toddlers, preschoolers, and the adults who love them, at Nazareth Center for the Arts. Nurture a life-long love of music and family time in your child. To reserve a demo spot & for information on registering, call Clarissa Louw, (Owner) at (484) 903-0220, or visit her website here. FREE demo classes are available through December 10th on Mondays, Tuesdays and Saturdays at 10am located at the Nazareth Center for the Arts. Like the Meandering Monarch on Facebook or more information. 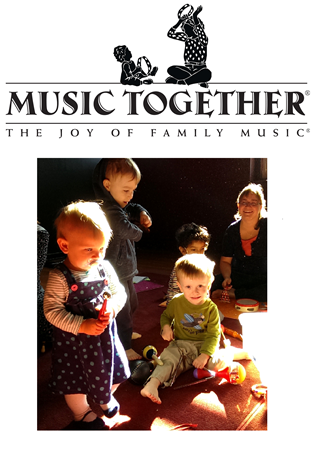 Here are some examples of what families who have experienced Music Together® with the Meandering Monarch are saying. "Our kids are in such a critical stage for learning and development during their first years of life and this class is one very positive way to maximize their potential! " "...these classes are a way for really small kids to develop a musical identity and outlet for musical expression. Plus, there’s socialization, lots of silliness, and tons of movement”. My Smart Hands Lehigh Valley Teaches babies, toddlers and preschoolers how to communicate using Sign Language! This is a fantastic gift for a child, grandchild or any little one! Their Level 1 Class is a 4-week session in which you will learn over 100 signs to use with your child. Some of the ASL vocabulary covered during our classes includes: everyday words, family, food, animals, emotions, opposites, bed time and play signs. Classes are full of music, singing and interactive American Sign Language instruction - created for parents and babies to enjoy together. Sessions will be held at Ju-Ju Monkey. Sing & Sign Family Story Time Drop-in Sign Language Classes are also available on Friday mornings at 11:15am or Saturday Mornings at 10:30am $10 Per Family Music, Stories, Sign Language instruction and a take-home craft included. Classes take place at Ju-Ju Monkey. Register early and save $10, use code MSHSAVE10 at checkout. "Had a awesome time today learning new signs, its my second class and I have learned tons of everyday signs already with cute songs to remember each! So excited to teach my 8 MO everything! Dena is a wonderful teacher I highly recommend her classes!!" As many of our followers know we have a strong partnership with Paper Bag Child and we were thrilled when we were asked to join in helping to adopt an apartment at the brand new addition of the Sixth Street Shelter, in Allentown. As residents of the Lehigh Valley and a strong supporter of local non-profits we are proud to spread the word about this amazing effort. We feel that as a partner in the in helping families connect with local resources, events and activities is it vital to recognize that some families are less fortunate. By assisting in getting them back on their feet we are, in a small way, helping to build healthy and happy families in the Lehigh Valley. Trish of Paper Bag Child has poured her heart and soul into making the most beautiful, welcoming apartment possible for the families that will be living there. The past few months she has been blessed by generous donations from members of the community businesses who have opened their doors for fundraisers and generous people willing to sacrifice their precious time to help in pulling this project together. This ongoing project came to a peak today when all of the gathered donations were brought to the shelter to be set up, assembled and to fill the empty shelves of the space. Thank you to Trish for organizing and delegating everything to each of your helpers to make such an amazing home for these families. Most importantly, this is an effort that will be continuously needing community support. As the Shelter receives families into the apartments, new materials, supplies, donations and more will be needed for many years to come. If you have an interest in helping to give back by donating used housewares, bedding, toiletries, non-perishable foods or have a connection to a local business that would like to get involved please contact Trish at www.PaperBagChild.com. Don't forget to follow her new blog as well to stay in touch with all things that are happening! The beautiful quilts on the beds were hand made by the women of First Presbyterian Church in Allentown. 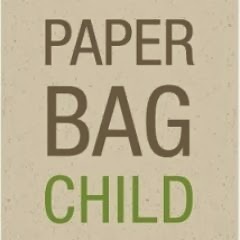 What is Paper Bag Child? Thank you to all of the sponsors that participated in helping to furnish and decorate the apartment! 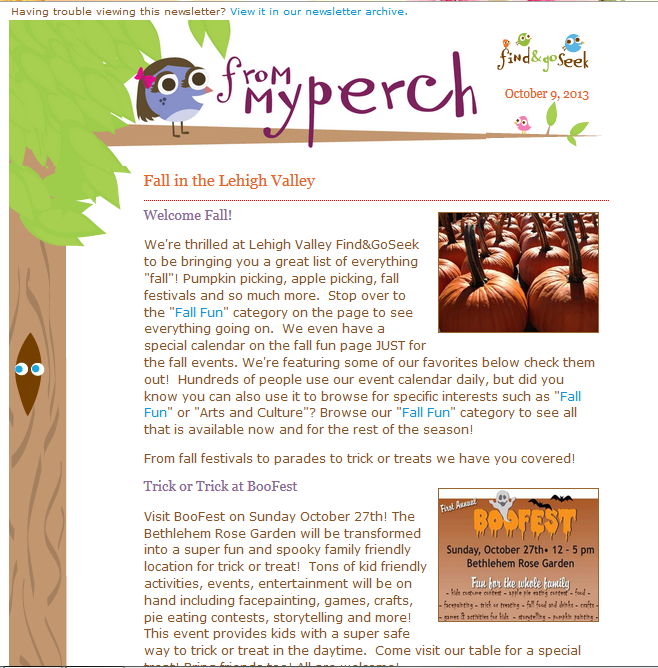 Last week we released our "Fall in the Valley" newsletter. It has been a busy past few weeks around here with tons of fall related trips all over! Though we are nearly halfway through October already and Christmas carols will be sneaking in in a matter of weeks there is still LOTS of time to enjoy some fun fall activities. 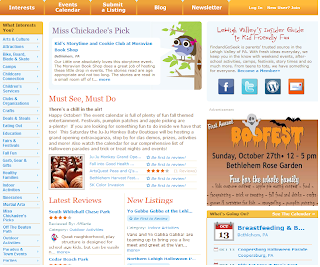 The fall fun category has local trick or treat nights listed on the calendar, lehigh valley halloween parades, fall festivals and more! Click here to subscribe and make sure you receive our next edition in your inbox! Finding even MORE on Find and Go Seek! 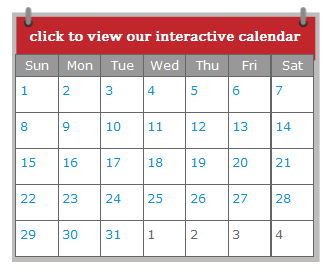 Our event calendar gets hit after hit day after day! and we are so excited to see that! 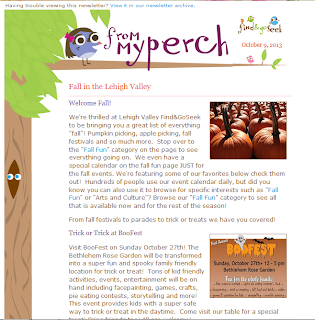 There's so much more to the site though, take a look along the left side of the screen when you visit http://lehighvalley.findandgoseek.net. You will see the interest tabs which allow you to browse through categories of kid-friendly entertainment, classes, attractions. Even find child care listings and preschools. There is nothing like another mom or dad telling you about a place that they LOVE (or don't love), these recommendations make finding everything you want and need for you kids so much easier. 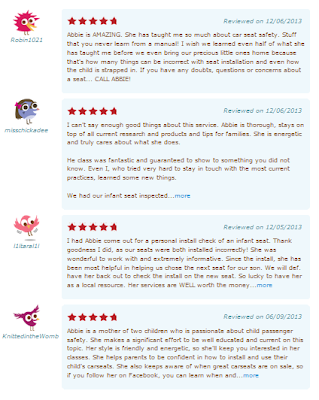 Help other families by sharing your opinion with Find and Go Seek! Add a review or two and give back to our community by helping others find the BEST and avoid the not-so-good! Get on now and tell the Lehigh Valley what you think! get started sharing reviews! 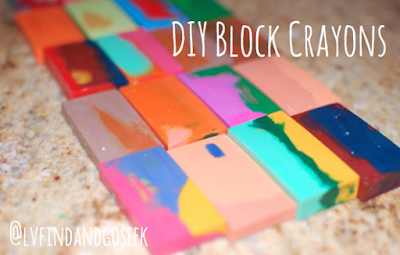 Want to be featured on our Blog! Find out how! We celebrated a birthday at our house last week and were extremely fortunate to get to use 3 fantastic local businesses who helped us celebrate! I want to share everything they did for us with all of you! We're so happy to be able to support LOCAL small businesses in the Lehigh Valley to celebrate this birthday and we recommend making an effort to do the same. Please share, like or link to this post as much as you like! 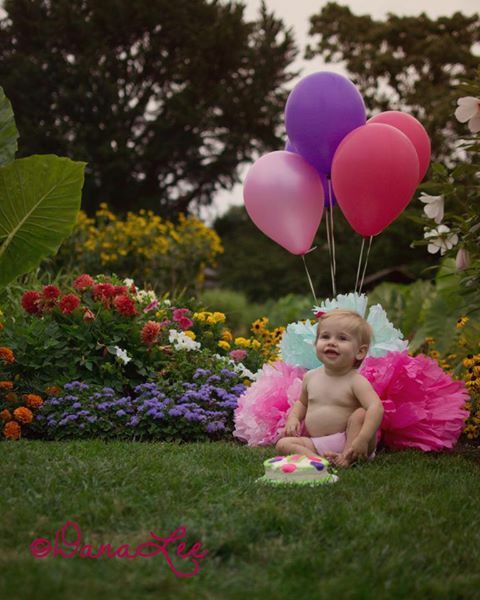 We are so thankful to Trixie's Treats, Photography by Dana Lee and to Kiera from MotherBaby Naturals for helping to make this birthday one to remember! We had cakes made by the very lovely and talented Tracy Mathews of Trixie's Treats. The large sheet cake she did for our guests was delicious and the little bit that was left over stayed really well in the fridge for about a week. 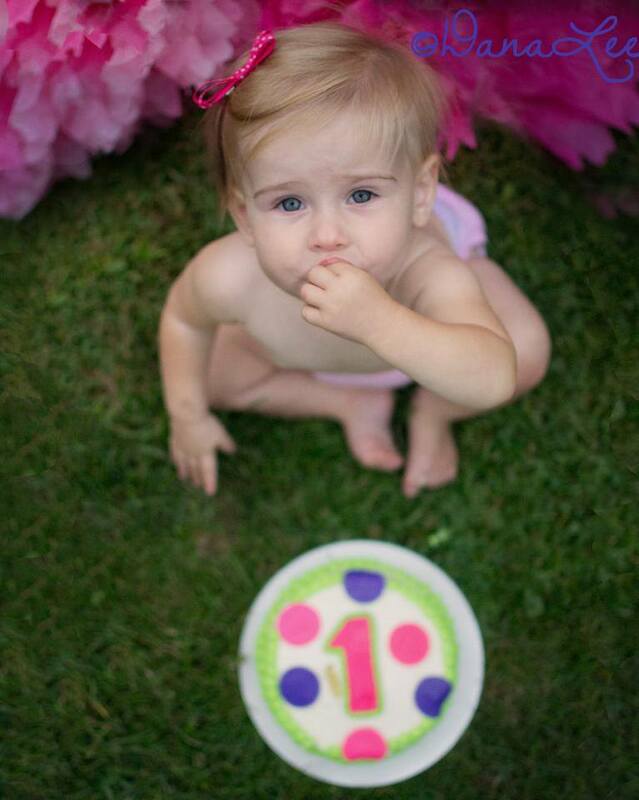 She was so kind to do a special smash cake to be used for our 1 year old photo shoot as well! 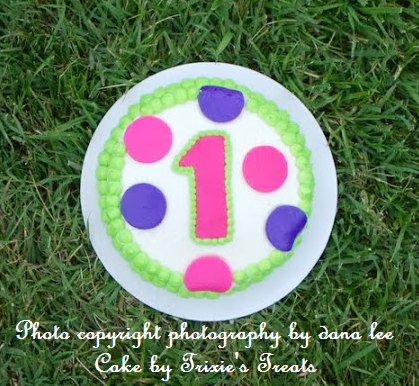 It was beautifully decorated with fondant polka dots and a number 1. Finally we concluded our week of celebration with a birthday smash cake shoot! We used the beautiful flowers and scenery at the Allentown Rose Gardens for the shoot and WOW!! The flowers were blooming everywhere and there wasn't a bad background in sight. It looked like a tropical oasis with all the rain we've gotten this month in the #lehighvalley. Dana Miller of Photography by Dana Lee couldn't have been more energetic or easy to work with. She is extremely talented and puts every ounce of energy into her work. Her photos are clear, focused and always seem to POP! She took our newborn photos as well so it seemed like the perfect end to her first year! 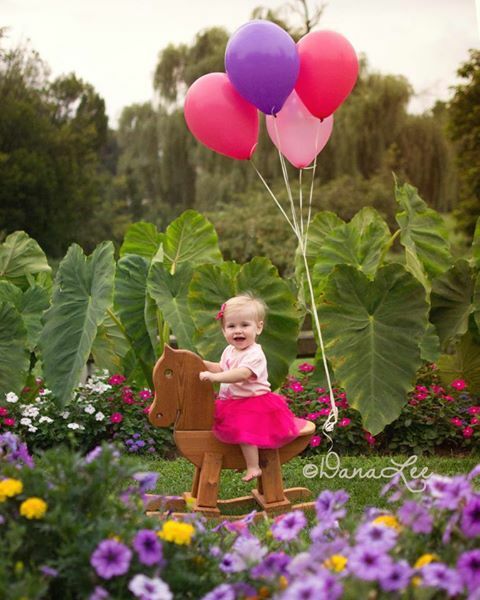 She specializes in newborn, baby, child and family photography and is centrally located in the Lehigh Valley. 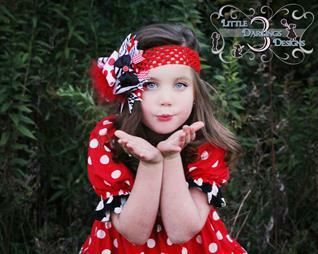 All Photographs are Copyrighted by Photography by Dana Lee and are not be to copied, downloaded or cropped. If you are interested in seeing more of her work please visit her facebook page at Photography by Dana Lee. Want your business to be featured on our Blog?? Contact us now to find out how!